We did it. Our public call was once again vindicated by Mr. Market itself. No amount of shenanigans and hot talk rivals being right on a market call, and of course profiting from our correct call. We were right both on direction and timing. It doesn't get much better than this. We're not boasting, we're merely proving the point that with a well thought out process correctly applied in the financial markets, most systems will almost surely work in the long run. Many traders fail to grasp this because they lack the patience, or worse still, approach this entirely wrongly. If you've been regularly following our content on social media, you would have caught our cue more than 2 weeks ago on 4th March (see our Facebook post here). We mentioned in our post that we sensed weakness in the dollar index (DXY) despite it trading inside technical support areas and rhetoric on the street calling for the opposite. The proof is in the pudding. We correctly called for weakness in the U.S. dollar since 4 March 2016 via our Facebook post. The dollar index has since fallen more than -3.3% (a huge move in the currency market) in less than 3 weeks, making it the sharpest decline since 2011. Technically, price action is at support and we wouldn't be surprised to see a short term bounce. However, sellers are still firmly in control so we will be potential sellers of corrective rallies. It is fascinating to watch how professional analysts were calling for a resumption of the dollar bull market moments before the sharp waterfall decline in the greenback. This isn't the first time we've been proven right by the markets. As all our calls and opinions are fully publicly and available for everyone to view in their entirety, it's easily trackable on how right (or wrong) we have been. We nailed it in October last year, and again in January this year. To learn more about the reasons on why we were (and are still) bearish the dollar, you are encouraged to thoroughly read through our various journals on our site. No more spoon feeding for babies... We're sure most of you agree on this point! Without revealing too much private insight we reserve for or Premium Subscibers, you should recall that we mentioned how the technicals on the dollar index have changed markedly and that the bullish impulsive trend was at risk of falling apart. Case in point. As you refer to the chart in the previous section, it is clear that the medium term trend line buffer zone (dynamic support) had been attacked multiple times in short order, with the most recent push lower succeeding in the bears' favor. Once this dynamic support area was cleared, the bids seemed to vanish almost entirely and price fell in a relatively near linear fashion. This speaks a lot about the hands the big players hold in this market and their willingness to hold on to their positions. A strange pattern has emerged whilst trading the dollar so far in 2016. USD tends to exhibit prolonged weakness during domestic U.S. trading hours, and this observation started gain credence after mid-February. During Asian and European trading sessions, the dollar performance has hardly fluctuated more than 2% in ether direction. Second of all, we note that absolutely financial conditions in the U.S. financial system have eased considerably (according to data from GS), while those in Europe hav atrophied mainly the victims of a strong euro and wider credit spreads. Looking slightly farther back, notice how price actually staged a clean breakout pullback sell setup earlier in February, offering traders a high probability trade with an extremely superior risk-to-reward profile. So just on a technical basis, there is a strong basis to be short biased the dollar. We expect the downtrend to persist, although price action may start to get volatile as we are approaching some key support zones. Selling into weak pullbacks appeals to us, traders that already have a short exposure on the greenback can look to add to their positions while those that don't should thread wisely with more caution. Unless you've been sleeping under a rock for the past week, you would have known about the latest March FOMC event last Wednesday which saw no change in the Fed Funds target rate, but provided revised economic and data projections, and of course Chair Yellen's press conference, all of which brought slightly more clarity for market participants. "The main beneficiary post-FOMC non event? Gold. Greenback is weaker, risk is slightly higher, and so are bonds. Oil closing today up 5%+..."
Without going into the minutiae, there are a few key takeaways we which to highlight to our readers. All in all, we like to term last week's FOMC event as dovishly-hawkish. Markets were generally expecting a Fed that leaned more towards the hawkish side. Disappointment on this front explained the market's readiness to sell dollars in exchange for (what we call) other "more discounted" currencies such as the euro and yen. A lot from December's meeting was brought forward to last week's statement. There was the same mention of market-based inflation expectations remaining subdued, persistent deflationary pressures due to low oil prices, and the Fed's resolve to bring inflation up to their long term mandated target (even though the core measure has already surpassed Yellen's target). External factors was another persistent mention, which means the balls are now in the courts of other central banks. FED: ECONOMIC ACTIVITY MODERATE DESPITE GLOBAL DEVELOPMENTS"
While there were other points, one clearly stood out. Chiefly, the Fed's dot plot (FOMC members' forecast of where FF rates would be down the line) implied only 2 additional rate hikes in 2016, as opposed to 4 hikes in December. Markets had not discounted for this, and by markets we mean the dollar. 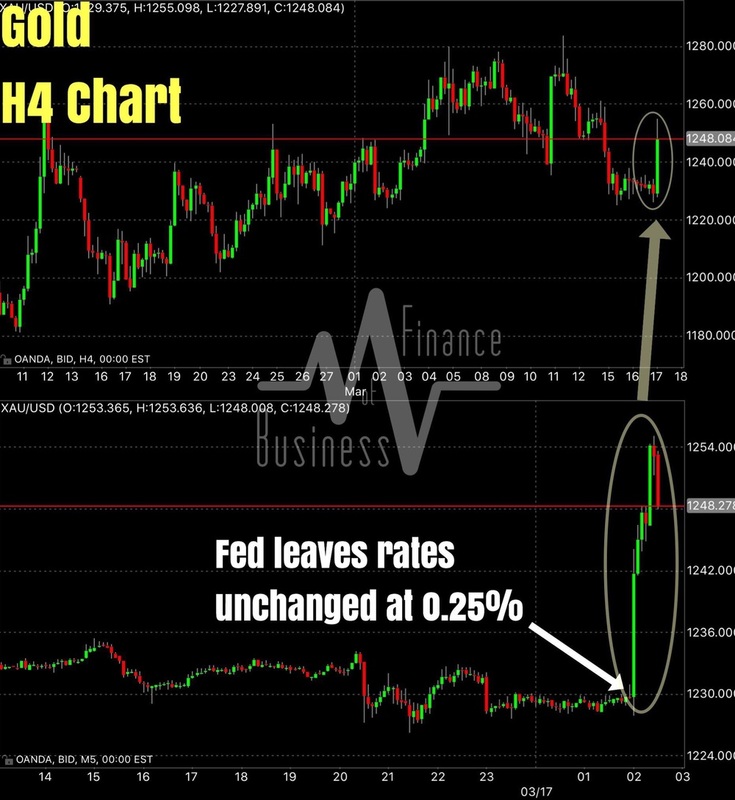 This development sent dollar bulls running for the hills, treasury yields crashed their most since late 2015, and gold exploded higher on the day itself. With markets reacting so strongly to this revised dot plot, it tells us that there might be more discounting left to do. While the dollar may not have fully discounted for this risk, other markets such as the Eurodollar and FF futures have been pricing in a dovishly-hawkish Fed for quite some time now. We've been documenting this on our Facebook page. We're sticking to our view of a dovishly-hawkish Fed in the near term. Watch oil prices as they will start to weigh more on the Fed's decisions going forward. And yes, we're still bearish the dollar. The Fed left interest rates unchanged during its June FOMC meeting, exactly as we previewed and exactly as the markets expected. According to most analysts, commentators, and in some part the financial markets themselves, just about every aspect of the June FOMC event was more dovish than had been anticipated. Unsurprisingly for us though, as we had already warned of an indecisive Fed; a once credible central bank which had inherited the tendency to troll markets left, right and center. We maintain our stance that the Fed will remain indecisive, further loose confidence about positive momentum in the economy, and thereby adhering more to a 'wait and see' rather than a 'do and adjust' policy. There's never been a central bank more thuggish than the Fed. First, it delayed hiking rates by more than 11 months, only doing so once in December by a tiny 25bp. Remember the vicious cycle of "promising to hike, only to scare markets into a drawdown, refusing to hike, therefore talking markets into a rally" we have been taught by the Fed to abide by? With each passing FOMC meeting (already 4 have passed this year), and with every twist and turn of the macro economic grade book, the markets have rallied and tanked in a vomit-including clusterf***, in the process trolling traders and screwing investors' portfolios. When we first saw the 38,000 print, we thought it was an error with our news feed. But no, the U.S. economy added only 38,000 non-farm jobs in May, the lowest since September 2010, and the biggest miss on record. It's really hard to overstate how morbidly bad May's payrolls were. It is, however, commensurately easy to kiss a June rate hike by the Fed a sweet goodbye. This report was so ugly that we feel it leaves almost no room for an alternative interpretation. Specifically, one of forgetting about a June rate hike. The Fed is almost certainly not going to hike later this month. With the addition of May's payrolls, we are outright bearish the U.S. dollar and will be looking for good opportunities to gain some short exposure. We are of course fully ready to stop dead in our tracks and turn on a dime, as must be expected when dealing with such troll-worthy elements. First it was the April FOMC statement that turned out to be more dovish than hawkish, and then it was the April NFP report that missed expectations badly, busting market expectations for a June rate hike. However as regular readers and subscribers to our journals will know, we believed that despite soft economic data and cautious/dovish Fed language, there was still a good chance for a Fed hike in June. The tides turned this week upon the release of the April FOMC minutes, and very abruptly so. A hawkish turn was something we warned about in the preceding days before the release of the April Fed minutes. It was also one of the risks we highlighted here, and here, under uncertainties regarding monetary policy. Yellen, we have a problem. April's jobs data was a disaster (as we had forewarned) and markets are starting to get properly concerned this time, judging by the way in which they reacted. A June rate hike by the Fed now seems less likely than ever before, with the Fed Funds futures market implying a mere 4% chance of a hike next month when the FOMC reconvenes to decide on the future of the U.S. economy. The start of May is really turning out to be a summer of shocks, which is why even Bill Gross could possibility foresee the advent of QE being launched by the Fed — Helicopter money. The April NFP report released Friday missed the headline expectation by 40,000 jobs coming in at 160,000, or the lowest since September 2015 when the U.S. saw only 145,000 jobs added. Last week was packed with central bank activity, with the Fed holding interest rates unchanged exactly as we previewed the event, and the BoJ's shocking stunner of doing absolutely nothing (despite heightened expectations of more monetary easing) has sent the U.S. dollar into a free fall, testing its May 2015 lows. The focus this week will be on the American jobs market where the BLS is set to release the April Non-farm Payrolls (NFP) report this Friday at 830am EST. This puts all the attention back on the greenback, which has already been capturing headlines from financial media all across the world. The consensus expectation is for an addition of 200,000 new jobs to the U.S. economy, down from March's 215,000 print. The U3 unemployment rate is expected to hold firm at 5.0%, but the focus will almost certainly be on wage inflation. Following our pre-FOMC primer on what to expect during today's April Fed event, the Fed has once again left the Federal Funds target rate unchanged at 0.25% - 0.50%. This is precisely what we talked about in out last snippet, that the Fed will rather err on the side of caution than to tighten prematurely and risk having to reverse its path of policy actions. The market now expects at least a 25% likelihood that the Fed will hike rates during their 15 June meeting, once again back loading the path of tightening. We reckon that the Fed will not wish to wait beyond June to throw in its next interest rate hike. Other than what we've mentioned above, this statement was more or less a snoozer and came in mostly as expected. We maintain our current stance on the markets we track and trade. The U.S. Federal Reserve will release its Federal Open Market Committee (FOMC) statement at 2pm EST this coming Wednesday (27 April). Market participants aren't expecting a rate hike at this point and with no press conference following the publication of the statement, the language of the document will be closely scrutinized for clues about the 15 June FOMC. The Fed has downgraded its rate hike expectations for 2016 citing global headwinds that have limited U.S. growth. So far employment remains the strongest pillar of said recovery but the job gains and the lowest unemployment claims in 42 years won't be enough to sway the opinion of Fed members to vote for a rate hike until other economic gauges show improvements. It's safe to say that markets will be focusing back on the greenback this week. Did You Just Short Oil At The Bottom? We hope you didn't. Because WTI and Brent are up some 42% and 48% from their January lows, respectively. We can only imagine the multitudes of traders shorting crude all the way up from $25 to the current $40 on Brent. It must have been painful, utterly jaw grindingly painful. We feel for you, because we were once part of group. A group which had collectively been betrayed by those oh-so-smart pundits calling for $20 oil, pundits with absolutely no track record, casually appearing on financial TV advising everyone and their pet dogs to short oil because the "fundamentals have never been more bearish". You've been trolled big time, and the market doesn't even care. Ain't that going to make you mad? Older PostDid You Just Short Oil At The Bottom? Be the first to receive fresh content from Business Of Finance. Register with your email address for the latest publications as well as updates delivered straight to your email. We respect your privacy. Your email address will not be distributed to third parties. Thanks! We genuinely hope you enjoy our content. Disclaimers: The contents contained herein on the pages of this website are for educational and informative purposes only. They should by no means serve as, be interpreted as financial advice or any trade and investment recommendation. We are not a licensed financial adviser. We do not advise on publicly traded securities or any other financial instrument that is otherwise traded over-the-counter. The views and opinions expressed are solely our own and of our contributors. Past performance may not be indicative of future results. It is prudent to always exercise thoughtful discretion and conduct due diligence before entering into any financial transaction in the financial and capital markets. We will not be responsible or be made accountable for any financial loss incurred as a result of trading and investing in the financial and capital markets. We do not provide any form of warranty, either express or implied, to users of this site. Any form of trading or investing involves risks to your capital, and may not be suitable for all individuals as the risk of loss can be very real. By using this website, you acknowledge and accept the aforementioned disclaimers. Our Cookies Policy: By using our website, you agree to our cookies policy. View our Cookies Policy Here.